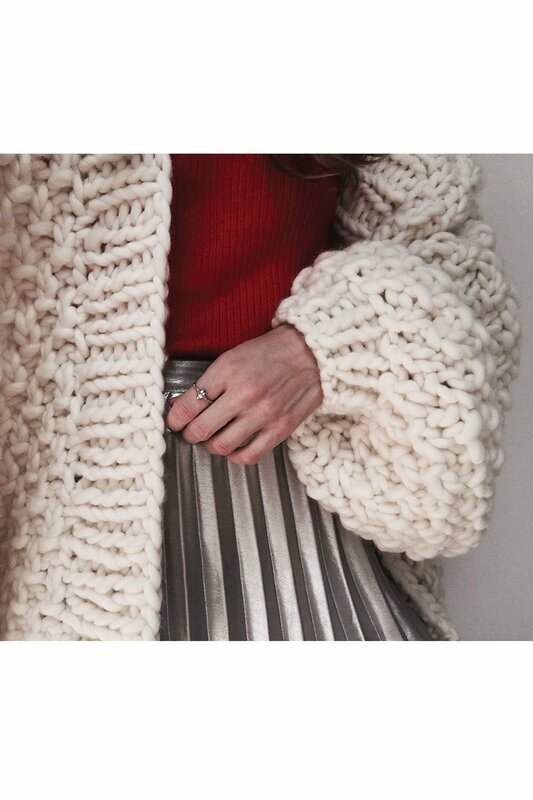 Auckland-based Nicole is The Knitter, a 25-year-old whose oversized wool sweaters in saturated colours have developed a cult following. These aren’t ordinary knits, these are haute couture, statement pieces. Her creations are so popular she has a two-month backlog of work but we've managed to lock in a few special pieces from her collection. All pieces are hand knitted in New Zealand by a group of well looked after hand knitters and each item is checked and hand finished by Nicole herself so she is confident all pieces meet her quality expectations. 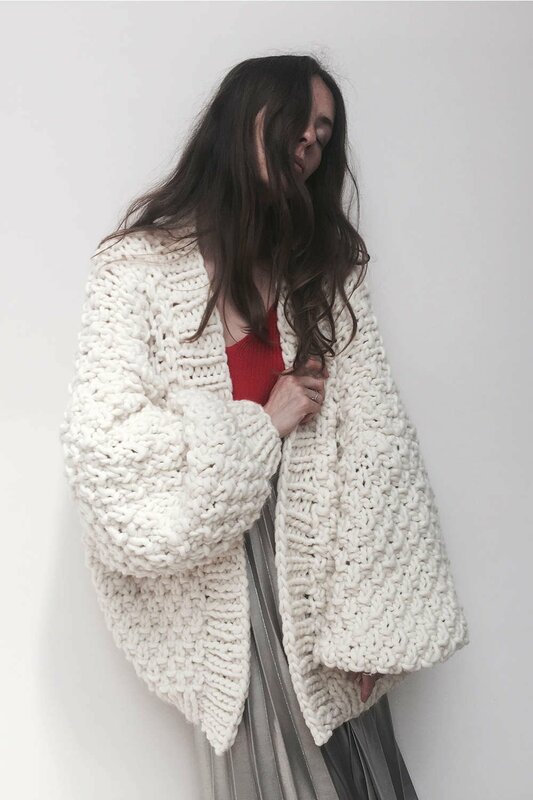 Nicole uses merino wool and mohair, both natural fibres that are an absolute dream to wear. A career in knitting certainly wasn’t foreshadowed at school. At 12, Nicole swindled her way out of a school scarf project by asking her grandma to knit it for her. “I guess that was my first little taste of knitting, even though I didn’t knit it.” A few years down the track, at Westlake Girls High School, she was told her cushion-sewing wasn’t up to scratch, and her teacher advised her not to take textiles again. Her natural medicine studies in Ellerslie are on hold, as of March this year as Nicole is flooded with orders for her unique pieces. Nicole dreams of having a team of 100 as she is struggling to keep up with orders coming from the United States, Europe, China and New Zealand since the 2015 launch of her site The Knitter. “I kind of always wanted this, but this year it took off and everything kind of happened. I feel very lucky," she says. It takes approximately three 8-hour days to knit a jumper, perhaps a bit longer. Knitting is laid out on the kitchen table; Nicole prefers to have the weight of the garment resting on a surface as the yarn is heavy stuff. She’ll knit with her laptop open, listening to Lorde or a Modern Love podcast. Her jumper patterns are homemade. She’s yet to learn to read knitting patterns, currently abbreviations like k2 and p2 are as meaningless as a foreign language. Demand is growing and Nicole has hired 20 knitters across New Zealand, one as far south as Wanaka. Knits are stitched together on laps in squishy armchairs, spread across coffee tables and even in front of the wrestling on telly - in one case. Her knitters have become close friends. She’ll often call in to see Denise, 80, in Onehunga to drop off wool, sometimes a bottle of milk. What do a 25-year-old and an 80-year-old have in common? “We talk about our skin conditions.” Denise started knitting when she was five, Nicole says. She grew up near a farm, and would pick sheep’s wool off her fence and knit with nails. An attraction to wool appears to run in the blood. Nicole’s grandfather John Stubbs was one of the first wool agents in New Zealand, calling on sheep farmers from Dannevirke to Ruatoria. The wool trade was buoyant when he left school and was a profitable career, he says. Recently, Nicole packed up and moved to an old beach house in Bethell’s Beach. Thankfully, cardboard boxes don’t get in the way of her profession. She can sit outside under the trees. All she needs is a seat, a ball of wool, and a pair of circular knitting needles. Cashmere/Possum Blend. What is it? Why is it so special?